I pretended not to understand the demand for money and just continued to smile. Here I was at the first check post in the Central African Republic and what I’d read and been told about the country seemed accurate. I was being asked to pay 5000CFA ($10) to have my passport details logged in a tattered notebook. The soldier in military fatigues looked serious enough. I wanted to comment on how shiny his black boots were, but my passport in his hands was more of a concern. Hiromu performed his normal display of stubbornness for the occasion, pretending like me that he didn’t understand. But it wasn’t working, nor was our explanation that we had already paid 55,000CFA for the visa in Yaounde and would not be paying more to enter the country. I guess most people paid something, but to concede at the first hurdle would be setting a bad precedent for the many check posts that lay ahead. So I went to retrieve my magic malaria letter, which states, in brief, that ‘Mr Peter Gostelow is working voluntarily on behalf of the Against Malaria Foundation and requests cooperation for an untroubled passage through the country’. Included at the top of this letter I had written, printed and photocopied several weeks before was a logo of the AMF, which matched that on my dust-covered cycling jersey I was wearing in this airless wooden hut. The soldier read the letter in detail, looked at me and my jersey with a raised brow and loosened his grasp on our passports. I half-expected he would laugh and throw the letter back at me, but instead it was our passports that were returned. The magic malaria letter signed by ‘Bob Mather’ had worked, although I feel it needs touching-up with a sentence or two to state something to the effect of: ‘under no circumstances ask Mr Gostelow for payment at your control post’. 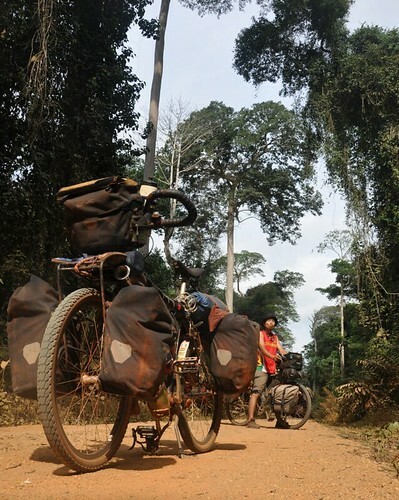 I could spend the rest of this blog post describing something about almost all of the next 17 check-posts that lay ahead of me to the capital Bangui, a distance of 600km. That makes it a check post roughly every 35km. I should note that not all of the military-clad officials manning these posts demanded money. The shock and novelty of a European and an Asian (one of them resembling Jet Li and the other The transporter according to many people here) rolling up on bicycles with a brief explanation in broken French to say they had crossed the border from Cameroon and cycled X number of kilometres over the past X months, sometimes diverted attention from the usual procedure which would probably take place when someone arrives in a vehicle at one of these posts. Our passports would be checked and sometimes the vaccination cards, but when they were seen to be in order and there was a lull in the exchange of words I would take my passport back into my hands, say ‘merci beaucoup’, and do my best to casually get back on the bicycle and pedal away as fast as possible before someone changed their mind and thought “Wait a minute. This guy might be on a poor man’s form of transport, but he’s white so must have a lot of money. I’ll call him back and demand $10 by asking for a document he doesn’t have”. At a few problematic check posts I let Hiromu produce his own magic letters. These consisted of slips of paper where he used Chinese characters to write down the name of the officers, then presented the paper with an explanation that if they kept these pieces of paper in their shirt pockets they would be protected from any harm. I found it difficult to keep a straight face as one soldier seemed hypnotised by the Chinese characters before carefully slipping the paper into his breast pocket. 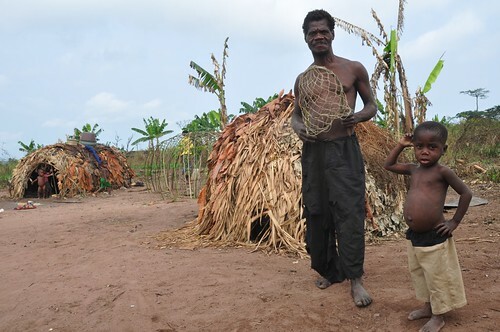 Traditional/spiritual beliefs are very strong in this part of Africa. Hiromu has since found better paper to write on, the colours of which match those of the Democratic Republic of the Congo flag, the next country where we anticipate more of these problem check posts. Entering the capital Bangui proved the biggest headache. Just when I thought that the check posts were becoming easier to negotiate and the keep-it-cool jocular rapport with the bored soldiers was working my passport got taken from me and stamped by the police. ‘But I don’t need I stamp’ I said, ‘I’m not leaving the country yet’. 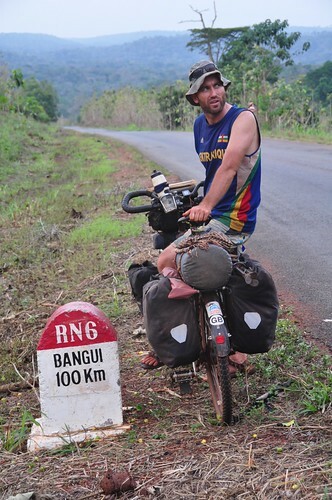 Well apparently I do to enter Bangui, so down it went in my passport, swiftly followed by a serious demand for $20. The magic letter didn’t work on this occasion, but fortunately I already had the passport back in my possession while the call for 10,000CFA was repeated. Hiromu on the other hand didn’t. It took another hour of waiting, explaining and staying calm before we both had our passports back and were free to continue. I think leaving the city might produce similar problems. 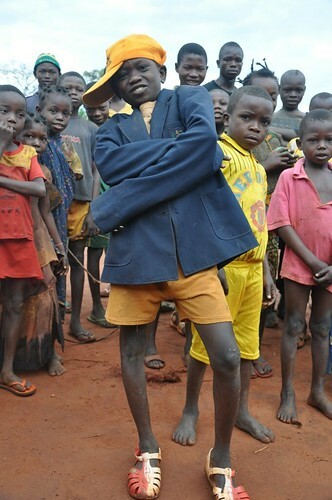 Between the check posts my journey into the Central African Republic has been a positive, but moving experience. Looking back over the last week I keep visualising the sight of half-naked children dressed in rags waving or running away from the roadside in fear. Their mothers, sitting close by in front of small mud-brick huts are peeling casava or stirring a wood-fired pot, smiling and calling out ‘merci’. I was never sure if this was intended as a greeting or some kind of thank you of sorts for visiting a country that sees very few foreigners. I saw similar scenes in Sierra Leone and Liberia, but life here seems more desperate. Nothing looks like it would have changed in centuries. Some villages, which were never any more than one or two huts deep from the roadside, were totally empty – their residents probably having walked off into the bush to farm. Little else seems to be grown here other than casava. The nation somehow survives on this unnutritious woody shrub. Finding alternative food to buy is hard. No one has money so there is little to be sold. 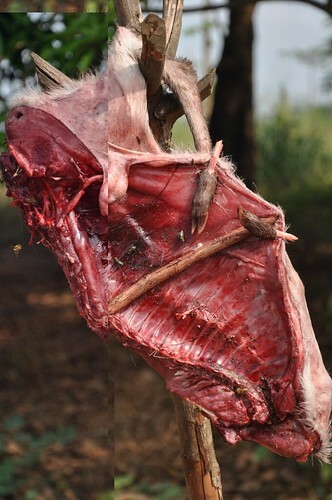 Bushmeat (gazelle, antelope, monkey, rats) has little appeal. I have eaten a lot of papayas, bananas, avocados and pineapples in the last week. I suppose things could be worse. 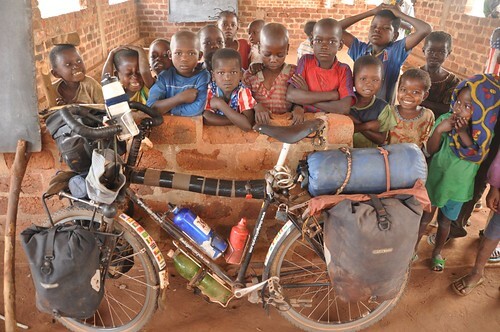 At night we camped beside schools, following the usual procedure of cycling into a village shortly before sunset and asking where the chief of the village was. Dozens of children would characteristically follow us to watch the procedure of pitching the tent and cooking. For seven continuous nights this consisted of us sharing 3 cups of rice (0.5kg), mixing it with tinned sardines, maggi stock cubes, and if we were lucky some tomatoes and maybe a few cloves of garlic. On one night I couldn’t finish my bowl so offered it to the children silently waiting a few metres away in the darkness. An older boy of about 11 came forward to take the bowl then returned to the darkness. There was a brief report of shouts. A minute later the bowl came back without a grain of rice in it. 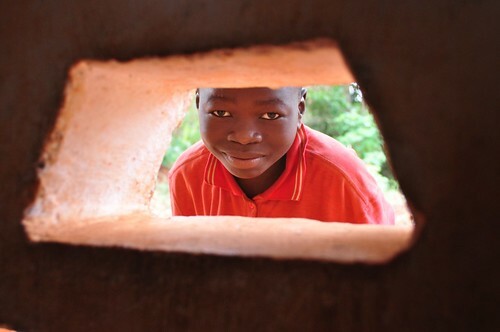 Many of these rural schools consist of little more than mud-brick walls and a tin roof. 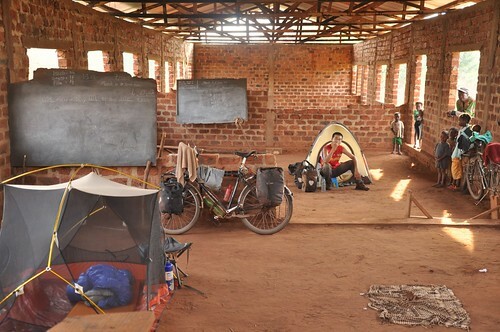 Some are mere one classroom constructions which would commonly be filled with 100+ children. In one village we packed the tents up in the morning whilst the children lined up outside to enter the class. They joyfully sang what might have been the National Anthem, answered a few arithmetic questions and were dismissed to go home 10 minutes later. The teacher gave me some explanation about the recent elections affecting the school time-table. To be honest most children here receive no education. It is very sad. 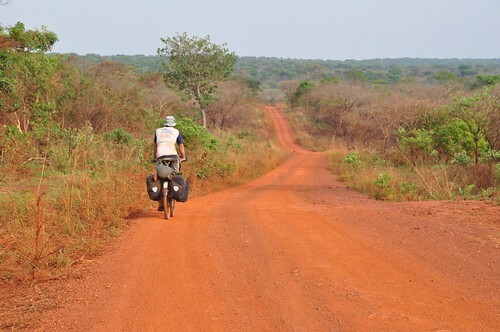 Heading east on a well graded laterite track we entered what might be classified as an area of dense forest. Those logging trucks you saw in the previous few posts still came thundering towards us, but with far less frequency. Occasionally a track would branch off into the forest with a sign marked ‘Acces Interdit’. Somewhere down there a team of men with chainsaws must be selecting the biggest trees and felling them. There was no other traffic on these roads other than the odd motorbike. Written in bold across this section of the Michellin map is a word embedded deep in the history of Central Africa’s forests – PYGMIES. It is an odd thing to write across a map; a bit like someone writing COCKNEYS on a map of east London or TUAREGS across a swath of the Sahara desert. Well sure enough it was pretty accurate. Within clearings of the forest and situated on the outskirts of several large villages I noticed the huts were smaller, rounded and the people sitting within them proportionally stunted in size. They smiled and waved as I paused to look at this Tolkien scene, perhaps as amazed at my colour and appearance as I was at theirs. Equally as fascinating out on this jungle road were the butterflies. Thousands rose up like colourful confetti in the wind as I cycled past them settled on the mud. So many species, sizes, flying styles – where had they all hatched out from? 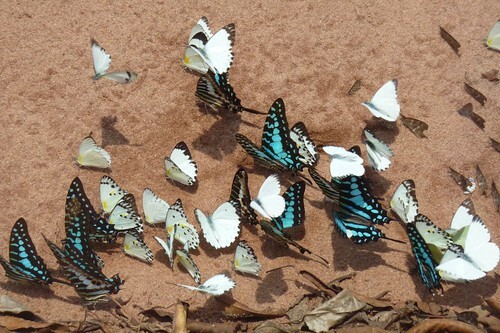 Less enjoyable when I stopped to look at this fluttering frenzy were the bees. Were these killer African bees I had read about? They could smell my sweat no doubt. And when one caught the scent it would return minutes later with a swarm of friends. They didn’t sting, merely wished to taste the exotic perspiration infused with local dirt. There were rivers too. Big swollen volumes of dark water flowing silently southwards. They were significant in their own right, with names on the map to prove it – the Mambere, Mbaere, Lobaye. 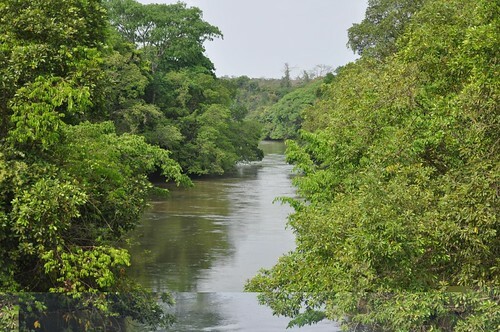 But these were mere tributaries of the Ubangui, itself just a tributary of the mighty Congo, Africa’s second longest river. When I crossed these rivers, often on surprisingly good iron bridges, I imagined what it would be like to load the bike onto a large pirogue and drift downstream with the current. Now that would be an adventure. 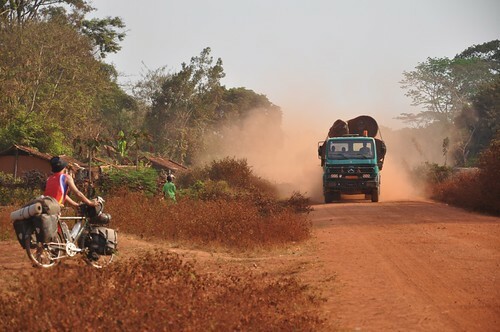 The deep forest disappeared all too soon (much like the pygmy communities) to be replaced by a secondary growth/savanna type vegetation, and after 500km+ of dirt tracks the tarmac started again. I expected the road into the capital to increase with traffic. It did, but the traffic was mostly human, not motorised. 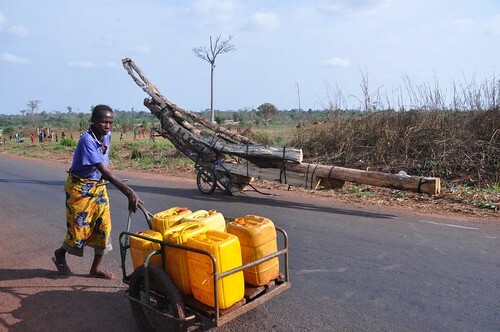 Men pushed enormous carts loaded with hundreds of kilos of wood towards the city, their chiselled muscular backs glistening with sweat in the afternoon sun. Women walked too, carrying loads on their heads. Many others waited at the roadside beside piles of casava and payaya for what little transport there was. Fuel is about the same cost here as that in my own country. 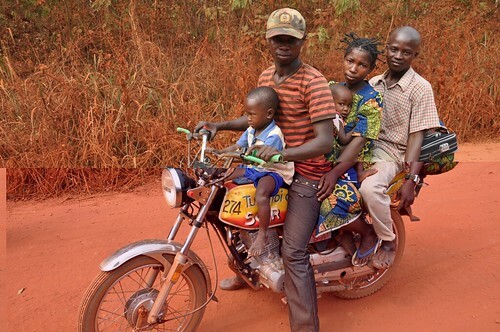 People cannot afford motorised vehicles to transport their produce, even when it does exist. I had the impression that the Africa I was seeing here was little different 30-40 years ago. Bangui itself looks like it’s been caught in a time-warp. The city, which sits on a bend of the Ubangui river, is my last stop here in the Central African Republic. Across that brown murky expanse lies the Democratic Republic of the Congo. It’s an exciting and daunting thought – the hundreds of kilometres of rarely travelled tracks that lie ahead in a country that has occupied my thoughts for many months. I expect more problem check-posts, mud, sand, intense heat, humidity, rain, sweat, bees, flies, mosquitoes, lack of edible food and clean water and scenes of desperate poverty on a scale greater than anywhere else on this journey over the next few months. This is the main course for me. If it isn’t hard I’ll be disappointed. All I hope is that I exit the other side with bike, body and belongings mostly intact and a few good stories to tell. I feel there will be plenty of those, but you might have to be patient to hear them. Great read Peter. The tougher it gets the more interesting it becomes. Just returned from Rwanda and have a little information that you may find helpful later on. Firstly the visa allocation method for Burundi has changed since I was last there. It is no longer possible to purchase a visa on the border. There is an embassy in Kigali, where they can be brought. The visa process is now similar to other countries in that you buy one for a fixed lenght of time. 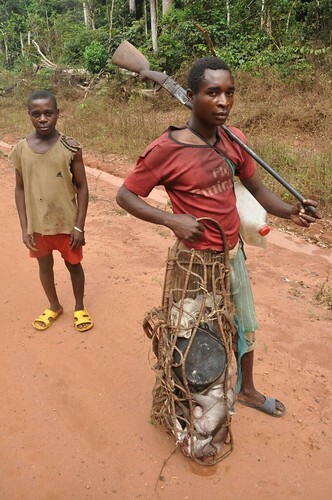 DRC: As you are no doubt aware exactitudes are difficult to find about this massive country. I questioned many people as I cycled along the border with Rwanda. Two sources would appear to be the most reliable for you. Number 1: Kafirongo Joseph, Quality Assurance Manager, Pharmakina, DRC. A pharmaceutrical company based in Bukavo DRC. email: [email protected]. A very educated guy who was in Rwanda to obtain medical treatment for his sick son. He speaks perfect French and reasonable English. On the western border between DRC / Rwanda there is relative calm at the moment. He feels it would be safe within the towns and there is only a limited risk of trouble in the bush. The Interahamwe fighters who fled to the DRC after the 1994 genocide have gradually intergrated into the population and although Rwanda sometimes has convert operations to locate these people and bring them back to Rwanda to face justice, my impression is that so long as they don’t pose a threat to Rwanda the government is happy to see them remain in exile in the DRC. However I suspect that Bukavu is probably too far south for your exit point from the DRC. Number 2: A returning Indian military officer finishing his tour of duty as a UN security attachment to the peace-keeping efforts in the DRC. He has in the past had to witness the killing of 4 of his men, who were attacked by local fighters of unknown determination. My impression was that the attack was because of the fact they represented the UN and that it was a political act rather than an act of violence for profit or other motives. He was of the opinion that the western border region was becoming more settled as each year passes and wished he could have visited more of the country. This was not possible as being a UN representative he would be a target. So Peter, good luck with your journey. I wish I could be there to experience it with you. Reading between the lines of your blog: It is difficult travelling with someone who has a different outlook to yourself, but need them all the same to provide safety in numbers for the trip. 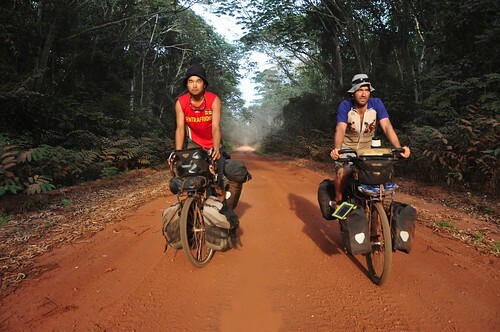 Had a similar problem when I teamed up with 2 French cyclists for my trip across the Sahara desert. Makes for an interesting read though. Bit late now, but I find my Katadyne water-filter a great tool. You can process almost any fresh-water. River, well of domestic into safe drinking water. I never have a problem and there is no need to find bottled water so it saves money in the long run. @Dennis Warner, Very interesting and many thanks for this information and the contacts.The plan was and still is to exit DRC from Bukavu to Rwanda, so a contact there is very useful. Excellent reporting Peter. Amazing what approaching the Congo does to people’s adjectives and descriptive prose. I hope you’ve got Conrad’s masterpiece with you to relish his insightful writing in situ. I’m also enjoying your photos, as someone said it is really something to see some of what you are seeing on this great adventure. All the very best of luck, and keep well and safe. Excellent post Peter, greatly enjoyed it. Good luck for the next chunk. Watching with interest, more intense and becoming more so as the days go by. DRC is your vastly critical point (from West to East). As you will imagine we are impressed with your optimism and increasing expertise in all sorts of very odd situations. 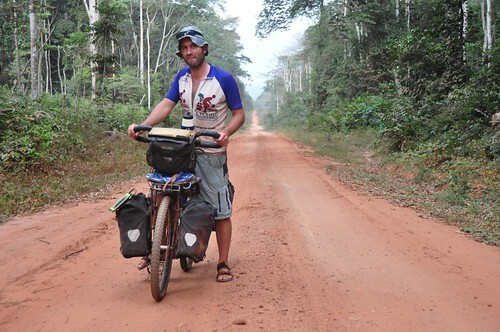 Take good care of yourself Pedro and your trusted friend (bike). Hi Peter, this has been one of your best posts yet! I really felt your thoughts and trepidations (cycling into the dust and not knowing what is hidden behind it!). It really is an art to keep calm and cool while negotiating with a bored/drunk/officious check point guard (reminds me of the Bosnian war check points – cigarettes or even matches worked very well to bring a smile)keep it up! Good luck and bon voyage through the “heart of darkness”. Gidday Pete, really loving your blogs and photos of CAR. You are coming up to the hard bit as you know. I have just read over my old diary from years ago about the CAR and DRC. Reading it reminded me of the friendliness of both countries but DRC has the only mention of daunting in it. Our food consisted of casava with every meal, rice with some bush meat and plenty of fruit. Bananas, paypaya, pineapple, and Mangoes where they grew. Many of the local people had growths on their necks and all the kids were pot bellied with malnutrition. The barter system was in full swing. Tin cans and of course salt was highly prized and we spent almost no money. We sold a glass jar for a huge hand of bananas. Hunt out the local boulongeries(Spell) in the bigger towns. Wonderful stuff. Once into the rainforest areas we had trouble keeping the locals at bay so we had to lay a rope around our camp and asked them to stay outside this. It worked. The diary also tells of log bridges which we were regularly falling through. See Pete, your bike will have the advantage here as you can push or carry it across. The one thing that remains is the friendliness of the DRC people. I hope this has not changed and you feel that you are safe. You are never far away from people, so you are never alone. The daunting bit refers to the vastness of the place and the slowness of travel. We were travelling just 30km a day some days so good health, great stamina and endless patience is a given. We were in a landrover so we had it easy compared to what you are doing. Keep those long winded blogs coming, lots of us are enjoying the stories and insight you give to these places and events. All the best mate for you and Hiromu. Great adventure. Thanks for giving some insight into an otherwise forgotten country. Great photography too! The one of you and Hiromu cycling through the woods is stunning. I couldn’t stop noticing that in some of your photos part of the image pixels are shifted, like in the bottom part of the jungle river photo. Is this a camera problem? Best of luck for the trip into the DRC, keep safe! I’ll be looking forward to read some of your stories. @Tiago, Thanks for notifying me of this. Didn’t realise it until you mentioned. It is not the camera – more the way the pictures have uploaded to Flickr. These photos have had to be resized and even at a small resolution they can take time to upload. What other photos have you noticed this shifting of pixels with other than the river with trees? @Peter, I think the “bushmeat for sale” (see top left) was the only other one. Fascinating blog. Thank you for the photos and stories. It’s just incredible to see photos of what CAR really looks like, what the people look like, right now. Aside from the multitude of other worries you mention, are you nervous about potential violence in the DRC? Based on Amy’s blog, I’m nervous for you and Hiromu. I’m sure you guys have mapped out the best route though based on as current as possible information. It promises to be one heck of an adventure. I can’t wait to hear about it. Very safe travels. One question ever since I have started following your blog I have been trying to figure out is why you have the top tube of your bike wrapped in foam? comfort? I have the same question for you, Peter! =) What’s that top tube cover for? Thanks for that compliment. The top tube is for several non-specific reasons. One is that it dumbs down the appearance of the bike, not that it was ever flashy. Another is to protect the top-tube when i lean it against objects. It also acts as a good cushioning for sitting and resting on. It may not stay on forever, and if i was to take it off now I’d probably do myself an injury as I’m so used to it being there. Terrific blog Peter – I have been waiting with baited breath. All the very best for your next leg. We will be thinking of you. Great post, as always Peter. Keep on riding safely. Security is mostly a superstition. It does not exist in nature, nor do the children of men as whole experience it. Avoiding danger is no safer in the long run than outright exposure. Life is either a daring adventure or nothing.